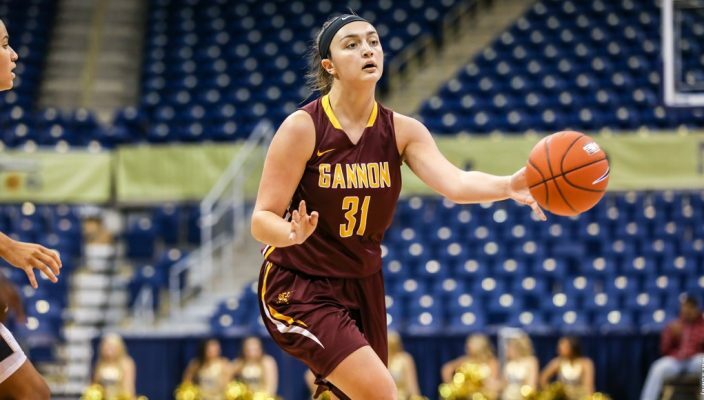 The Gannon University women´s basketball team saw its three-game winning streak come to a halt last week after dropping back-to-back road games to rival Mercyhurst and Millersville. Saturday’s 63-57 loss to Millersville and the 72-66 setback at the hands of Mercyhurst on Jan. 23 left Gannon 9-11 overall and 5-7 in the Pennsylvania State Athletic Conference going into today’s 5:30 p.m. game with Slippery Rock at the Hammermill Center. Saturday’s matchup with Millersville was tight until the late stages when the Marauders put together a 14-2 run over the final seven minutes to take home the victory. Gannon started the game with a 6-0 run on baskets from Lauren Tewes, Chelsea Rourke and Sydney Mitchell. Nicole LaCava extended the lead to 8-3 with a layup, and a Tewes’ steal that ended in a layup put the Knights up 18-11. Rourke capped the scoring for Gannon in the opening quarter with a pair of free-shots. The second quarter did not go as smoothly as the opening one, as Samantha Brusha continued her hot shooting for Millersville to bring her team to a 20-20 tie. Baskets by Rourke and LaCava gave Gannon a 24-20 lead and Boston McKinney’s third 3-pointer helped expand Gannon’s lead to six points before Millersville cut it to two points at the half, 32-30. Millersville outscored the Knights 19-16 in the third quarter, but the Knights trailed by only one at 49-48 heading into the final decisive quarter. Gannon built a lead as big as five on LaCava’s putback with 7 minutes, 6 seconds to play, but the host Marauders responded with a run to tie the game. Free throws helped Millersville move to a 59-56 lead with 1:20 remaining, ut a free throw by Mitchell pulled the Knights within two at 59-57 with 33 seconds remaining. Free throws by Millersville’s Lauren Lister and Olivia Mottern helped the Marauders seal the win. LaCava and Mitchell each scored 10 points to lead the Knights, who shot just 30 percent in the second half after shooting 57 percent in the first 20 minutes. On Jan. 23, the Knights found themselves in a tight struggle with the rival Lakers, as the two teams were tied at 59-59 with three minutes to play. But Mercyhurst went on an 11-4 run, with eight of those points coming from the free-throw line, to move to a 70-63 lead with 11 seconds remaining. Gannon committed three turnovers and four fouls during that stretch. The Knights had good success early, as thepy built an 18-11 first-quarter lead, but Mercyhurst countered in the second quarter with a 16-4 run and eventually led 31-29 at halftime. Rourke finished with 15 points to lead Gannon’s scoring while LaCava added 13 and Mitchell 11. The Knights outrebounded Mercyhurst 38-29 and shot 46 percent from the floor but committed 21 turnovers to just nine for Mercyhurst. Following Wednesday’s game with Slippery Rock, Gannon will travel to take on Pitt-Johnstown at 1 p.m. Saturday, then host Seton Hill at 5:30 p.m. Wednesday, Feb. 6, at the Hammermill Center.